Previously I have talked about the resignation, an important part of that process is the Exit Interview. Exit interviews are usually conducted with the resigning employee, and it is done just before they their last working day. From the employer’s point of view, the main goal of the exit interview is to understand the reasons behind the employee’s resignation, here criticism is a very helpful tool for improvements in the organization. They are also a great opportunity for the company to enable and ensure transfer of knowledge and experience from the resigning employee to the replacement, or even to brief the department on current engagements Good exit interviews should also produce valuable information about the company, to assess and improve all aspects of the working environment, culture, processes, procedures and systems, management and development, etc. Many employers unfortunately ignore this great opportunity that exit interviews offer, the main reason is usually that exit interviews haven’t been done correctly in the past, also, the potentially subjective results make it even more difficult task; the time involved and the unspoken corporate urge to avoid exposure to criticism is another factor. Regardless, exit interviews are a unique opportunity to survey and analyse the opinions of the resigning employees, who are usually more upfront, constructive and objective with the information than staff still in their jobs. In leaving a company, resigning employees tend to feel liberated, and as such provide a better source of objective feedback than employed staff do when answering surveys. From the resigning employee’s point of view, the exit interview is a great chance to give some constructive criticism and to leave on a positive note, with good relations and respect. Blame, revenge and anger are destructive feelings and behaviors, so resist any temptation you might have to go all out, guns blazing. Be calm, respectful, objective and as helpful as possible. In the future you may wish to return to the organization (situations and people change), and you may cross the paths of your ex-colleagues, managers in the future. The saying about treating people well on your way up because you might meet them on the way down applies just as well on your way out. The exit interview is an opportunity to shake hands and leave as friends, not as enemies. Why do the exit interview? They are the best time to ‘make peace’ with disgruntled employees, who might otherwise leave with vengeful intentions. They are seen by existing employees as a sign of positive culture. It is a good way for managers to learn some leadership mistake. 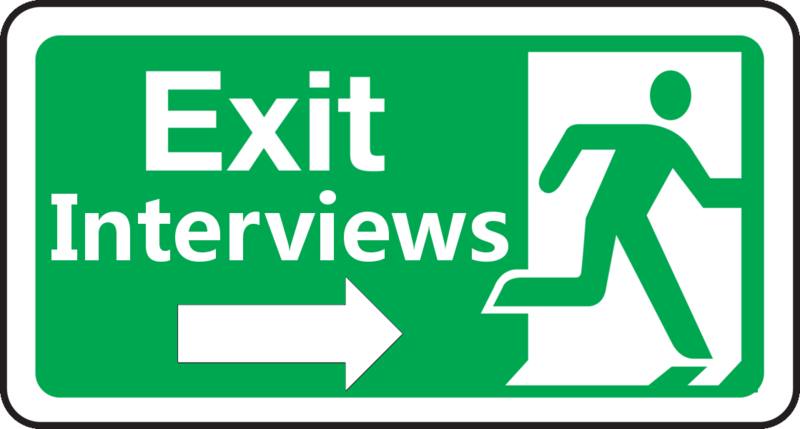 The results and analysis of exit interviews provide relevant and useful data directly into training and development, how to improve recruitment and induction of new employees, and how to improve staff retention. Exit interviews, and a properly organized off-boarding process improve the chances of successfully obtaining and transferring useful knowledge, contacts, insights, tips and experience, from the resigning employee to all those needing to know it, especially successors and replacements. Most resigning employees are happy to help if you have the courage and decency to ask and provide a suitable method for the knowledge transfer, be it a briefing meeting, a one-to-one meeting between the replacement and the leaver, or during the exit interview itself.